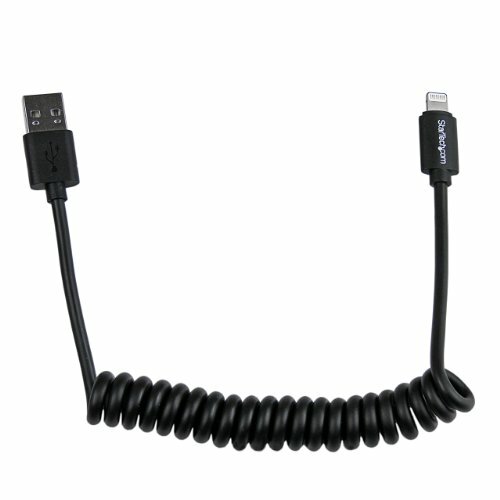 The USBCLT60CMB Black Coiled Lightning to USB Cable for iPhone , iPod , and iPad can comfortably be stretched out to up to 0.6m/2ft to reach your mobile device and when compressed can be tucked out of the way to provide simple, tidy connections – great for charging in your car (requires USB charge port). Colored to suit your black mobile devices, this Lightning to USB cable provides a reliable solution for both syncing and charging and provides a compact solution that makes it perfect for carrying as an iPad or iPhone accessory. Plus, the reversible 8-pin Lightning connector can be plugged into your iOS-enabled device with either side facing up, meaning there is no wrong way of inserting the cable into the device. This durable cable is Apple MFi certified and backed by StarTech.com's 2-year Warranty to ensure dependable performance. View More In Lightning Cables.